What difference do individuals make to history? Are we all swept up in the great forces like industrialisation or globalisation that change the world? Clearly not: real people-leaders in particular-and the decisions that they make change our lives irrevocably, whether in deciding to go to war or not, decisive tactical choices made in the heat of battle or changing the economic fortunes of countries. So if people-explorers, rulers, politicians, campaigners-make a difference in history, what is the role of personality? What difference did, for example, Nixon, Franklin Delano Roosevelt, Montaigne or Stalin make? And what about less visible but influential people such as Edith Durham in the early twentieth century in Eastern Europe or Fanny Parks in nineteenth century India? Is it possible to find or discern patterns in different types of personality-tyranny, risk-taking, curiosity, reluctance to act? This pithy book interrogates the past to ask very big questions about the role of individuals and their behaviour. It really matters: the personalities of the powerful can affect-for better or worse-millions of people and the future of countries. 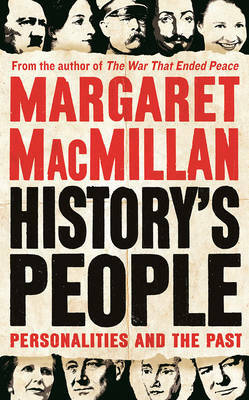 Like all the best history, this book colours the way you see not only the past but the present.